Tara has to cancel Zumba Tuesday night this week. Sorry, ladies. She will try for a Wednesday or Thursday morning make-up class this week. Stay tuned! Back to School Lock In! What: Games, Pizza, Popcorn, Movies, and Friends! What to bring: pillow, sleeping bag or blanket, toothbrush, washcloth...we don't have showers! Bring your favorite board game, if you like! Please RSVP by August 1. ***There will be no afternoon or evening classes on that day. Adult class will meet at 11am that morning. Any participants 4 years or younger will need to be picked up by 9:00pm or accompanied by a parent or guardian. Register for International TKD Fest NOW! It is now time to register for the May tournament! Go to www.tkdfest.com for online registration. Early bee deadline is May 2. The tournament will be held May 10 at the Expo Center in Industry Hills. Forms will compete in the morning and Sparring will be in the afternoon. We would like to take a big group to this one! Aubrey and Jadie are competing on Saturday in Pomona. Aubrey's division is at 8:30am. Jadie's division is at 12:30pm. There is also a demo competition at 11:30am, which should be a nice show. There will be no Zumba class Tuesday, March 18. See you on Friday morning at 9:30am! Congratulations to all of our students who were promoted on Friday! We are so proud of you. Keep working hard. Congrats to Luke, our Student of the Quarter. Also, special congratulations to Noah, Noah, and Aubrey for receiving their 1 Year Awards! 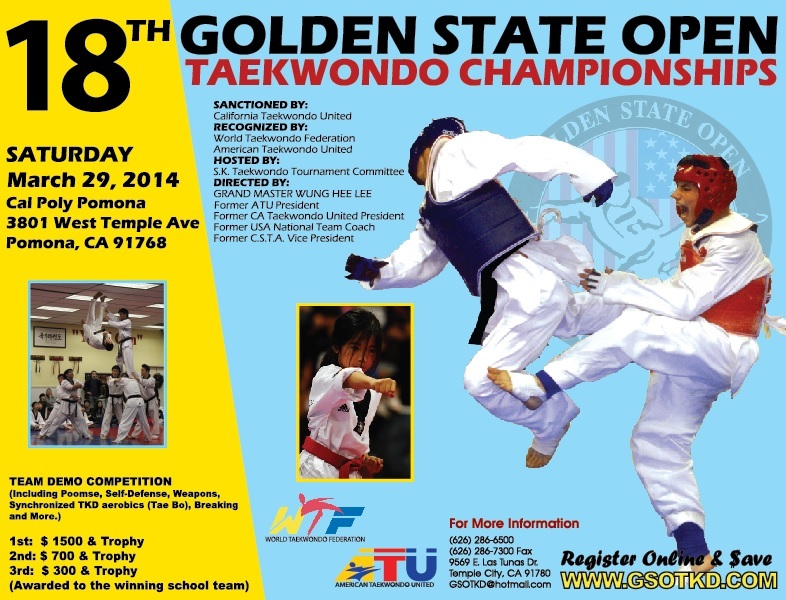 Please let us know if you are planning to compete in the Golden State Open March 29. We have a couple students planning to go. It is in Pomona. It should be a fun day! We have noticed that students perform better when they arrive in uniform. Not only do they have a different mindset in a uniform, but they can simply perform better physically. Martial arts pants allow room that other athletic pants or casual pants do not. This helps us stretch and kick to our highest capabilities. So we are asking that every student arrive to class not only on time, but in uniform. This means taekwondo pants and either our uniform top or one of our tee shirts. To facilitate your laundry needs, most students will need more than one pair of pants and top. Our daughter has 5 uniforms and about 10 tees. She still sometimes has a problem finding pieces. We will offer the in-stock uniforms and tees at a discounted price until April 1. Tees will be $8 and uniforms $24. Please see Tara to purchase from our current inventory.